For $200, you're getting a 6" FHD IPS LCD display, a MediaTek Helio P10 SoC, 16GB of storage, 3GB of RAM, 21.5MP/16MP cameras, and a 2,700mAh battery. Plus, this phone just recently got Nougat, if that sweetens the deal any for you. 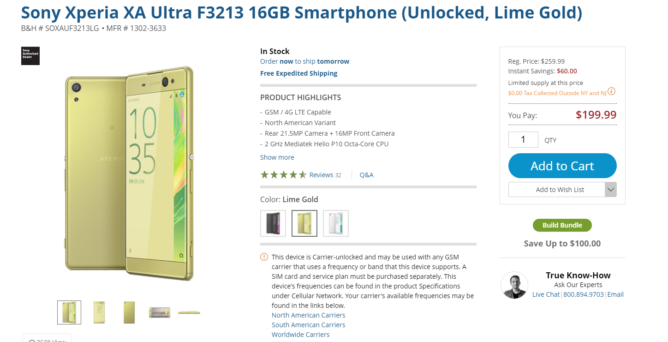 And it is unlocked for use on GSM carriers in the U.S. It is definitely worth noting that only the black version is on sale for $199.99 on Amazon, while B&H has both the black and lime gold (blech) editions for $200. So if you were hoping for the white model, I'm sorry to disappoint you. As usual, hit up the source links below to get started.